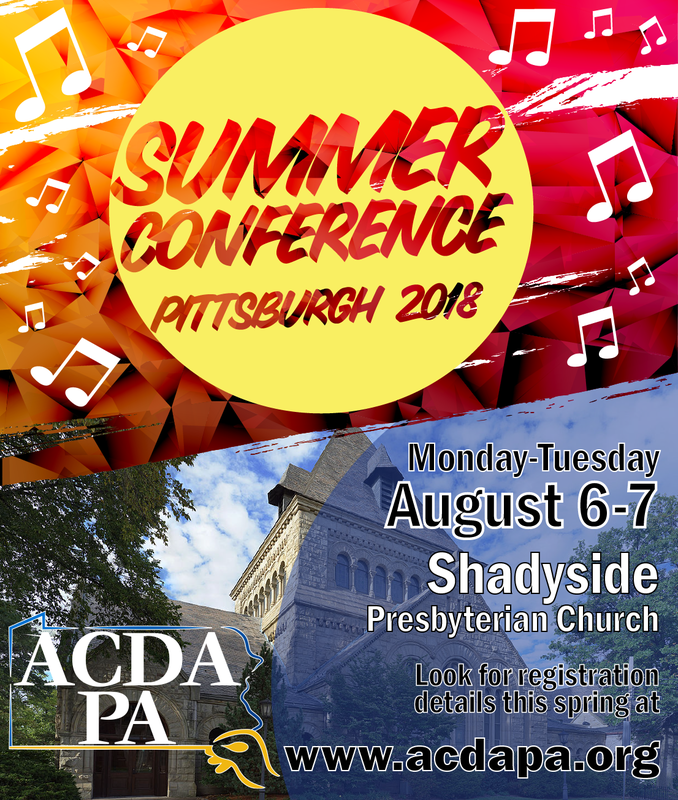 Spend two exciting days connecting with colleagues, learning from experts, reading through new music, discussing common issues facing us as choral conductors, and enjoying each other’s company all in the beautiful setting of Shadyside Presbyterian Church at the 2018 ACDA-PA Summer Conference in Pittsburgh! The Musical Source. Spend a relaxing evening on a Gateway Clipper Riverboat dinner cruise taking in the skyline of the city and singing with your friends. Recharge your “musical batteries” for the season ahead. Register now for the best rates! And be sure to make your reservation at the Shadyside Inn as soon as possible. Conference rate expires July 4. Extend your stay for a few days and take advantage of all that Pittsburgh has to offer! Heinz History Center, Andy Warhol Museum, Phipps Conservatory and Botanical Gardens, Carnegie Science Center, Carnegie Museum of Natural History, and Kennywood Amusement Park are only a few of the activities that await you. And Pittsburgh has become a “foodie” destination, so expect a choice of restaurants that will suit every taste. Stick around after the ACDA-PA Conference and create your own experience in the ‘Burgh! ​Andrew Megill is recognized as one the leading choral conductors of his generation, admired for both his passionate artistry and his unusually wide-ranging repertoire, which extends from early music to newly composed works. He is Professor and Director of Choral Activities at the University of Illinois (Urbana-Champaign), where he leads the oldest doctoral program in choral conducting in the United States. In addition, he leads three of North America’s finest professional vocal ensembles: the Montreal Symphony Orchestra Chorus, the Carmel Bach Festival Chorale, and Fuma Sacra. His performances have been praised for their “power, subtlety, and nuance” and “profound spirituality” [Le Devoir, Montreal] and have been described as “piercing the heart like a frozen knife” [Monterey Herald] and “leaving the audience gasping in amazement” [Classical NJ]. free wi-fi, free parking, a fitness center, and many other amenities. Group rates expire July 4, 2018 at 5:00 pm. Guests can secure a suite within the block by one of two ways; by emailing Mariena at reservations@shadysideinn.com or by phoning the hotel at 412-441-4444. If phoning, please ask guests to speak with Mariena, Melissa or Bridget. It's important that guests state the August 5 & 6 American Choral Directors Association Group when corresponding. Click here for a more detailed schedule, including interest session titles, presenters, and descriptions.